If the outlet from the FilterPod is too low for a gravity system, we can supply a 600mm diameter, 240V pumping station. 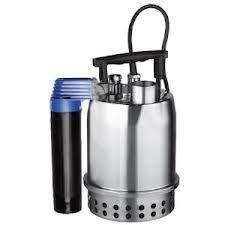 These can either pump settlement tank effluent INTO the FilterPod, in which case the FilterPod can be above ground with no installation costs, or pump final effluent AFTER the FilterPod as per a normal pumping station. They are made specially for WTE. With a pumped influent, the FilterPod is sited partially, or wholly above ground (depending on the outlet invert required) with the soil mounded up to it. This makes the installation a fraction of the price of a fully underground system. The pump chambers have a 25 year tank warranty. he chamber is a one piece construction with no possibility of groundwater ingress at leaking seams, joints, etc. The pump has an internal float switch with no float arm to catch on the side of the tank. It is capable of pumping a head of 6.5 metres and costs about £5/person/year to run on mains power. We stopped supplying the Solar Powered Pump Station as the solar panels, batteries and regulators were constantly being stolen from the installation sites. They were too tempting to thieves as the system can also run shed lighting, garden water features, etc. They are not so keen on stealing submersible pumps. The solar panels were also broken by stone-throwing vandals on a regular basis and the 12V system was not understood by electricians (used to 240V supply) and installed incorrectly. The Solar Pumped option is still available from the manufacturers if required. Please call for details.